It took some time but here is now an installer for Kate on Windows. Note: This would not have been possible without the big effort that the KDE on Windows people have made to get stuff to compile on Windows and keeping sure that it continues to compile. Thank you! it look like kate need some missing breeze icons (symbol list) if so please let me know. BTW: Breeze icons git repository caused me some problems on windows as symbolic links don’t work properly there. I have had to create CMake code to duplicate some of the files. Any hints on how to work around that without manually adding copy commands? https://geektimes.ru/post/50878/ — Some info about links on windows, but in Russian language. Is it possible to run Kate (and DBUS) from a readonly directory without actually installing? 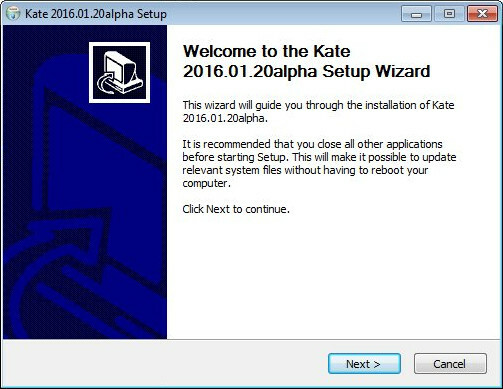 It should be possible to install Kate on one computer and copy the install directory to another into a read-only folder, but Kate will try to write configuration data to the users configuration directory. I have not tried this setup tho. which plugin do you use to get that nice entire document overview on the right side? this is pretty awesome. Already using it. Do you think it would be possible to build Kmail as well? I am using the kolab version now, but a kf5 version would be super nice. does it support SSH ? for the purpose like connecting to server remotely on RHEL from windows. The Qt windows integration plugin uses the native file dialogs that do not support remote protocols. So unfortunately not. There could be a possibility to create a platform plugin that uses the KDE file dialogs, but that is not the easiest and not a quick task to fix. Thank you so much for the windows build. I’ve tried many editors, but still kate turns out to be the most convenient one. Although, the current build sometimes hangs (using 1 CPU core and slowly eating up memory) — I still did not find the exact root cause for a bug report. Luckilky, that happens not too often. I found one strange issue, though. I use dokan-based sshfs on windows to edit remote files, and once I save a script file, its executable flag is cleared (I have to issue ‘chmod +x’ via ssh). Is there a way to stop kate from clearing the executable bit? I used notepad++ previously as an editor, and it somehow it just preserved that bit (the scripts remained executable, other files remained not executable). 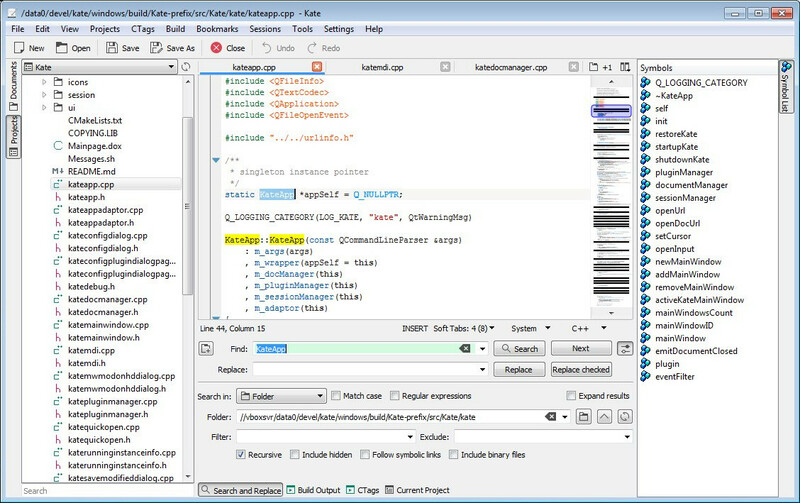 Kate uses QSaveFile which saves to a new file and then replaces the original with the new one. Since rename usually is very close to atomic, the risk of loosing data in the file because of an interrupt while writing is almost 0. I suspect the problem is that the new file is created with windows permissions that dos not have executable bit and then renamed on top without the bit. Notepad++ probably writes directly to the original file and thus keeps the flags. Yes, looks like it’s the reason. Well… maybe I’ll resort to some inotify scripts that will `chmod +x` upon file change. Anyway, this whole toolchain (ssh → windows via dokan → editor) loses POSIX permissions by design, so it’s not quite unexpected, just a bit inconvenient. Another question :) I want to create a custom bash indentation script. Where to place it? The official instructions are to place this script to “$XDG_DATA_HOME/katepart5/script/indentation/”. I tried all possible folders in “C:\Users\my_user\AppData\Local” where I found anything like ‘kate’ — but still there is no option ‘bash’ in the ‘Indentation’ menu. I directly defined XDG_DATA_HOME in the windows environment configuration dialog, but still no change. Also I did not find a place where the default indentation scripts reside — I’m ok to place my script there, I’m a localhost admin. Hi. Thank you for this great release! Can you please enable the konsole inside kate? Is it possible?